Now, think about the front end, in the sales process, by converting leads in a more organized and efficient way so that construction profits grow. The experience of many contractors, especially those in the specialized trades like roofing construction, find that the job of managing leads can be a tiresome and time wasting. 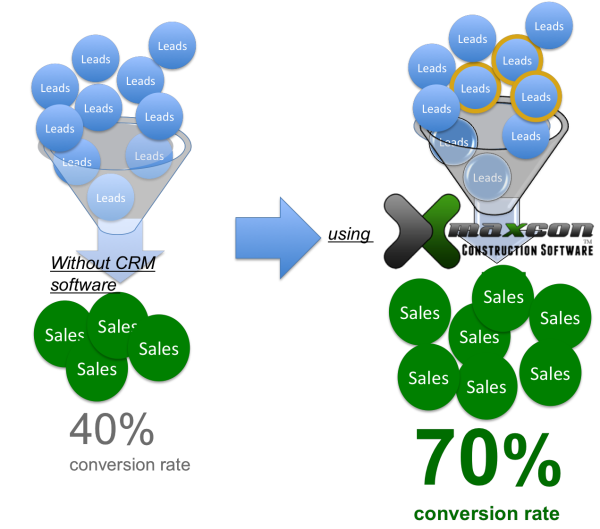 Take a look at this sales funnel below. From our experience as contractors, and with talking with scores of other contractors, we find that a typical conversion rate using traditional methods of sales lead organization and management is around one-third. One estimate of from a very sales focused roofing contractor using traditional paper based methods of sales meetings, handing out leads, more meeting, and follow ups was that he was able to achieve 40% sales conversion rate. That’s right, for every 10 leads coming in the door, he was able to move four out of ten into the “sold” column. more time spent in meetings than selling. What’s a sales lead worth to a contractor? … a lot! Taking a hypothetical example, say, a $12,000 roofing job, each lead has a potential gross profit contribution of possibly 30%. That means $3,600 to the bottom line excluding the covering of crew and production salaries and wages. For each lead! Using contractor CRM software to get big gains in the sales lead conversion rate. Following our roofing contractor who was among the top in converting sales leads, he became frustrated with the time wasting and lost leads using traditional paper-based systems. He began a search that resulted in a 5-year journey of building a tailored customer relationship management software for residential contractors. It was targeted toward the needs of the specialty companies: roofing contractors, siding contractors, window companies. The end result is MaxCon Construction Management Software. The result? A CRM software for roofing and specialty contractors that yielded dramatic results in lead conversion. The added bonus was that it also organized the entire company, from front end to back end, production – accounting – sales – administration – crew management. Back to those conversions. Using the MaxCon CRM software, sales conversions skyrocketed to 70%. What does this mean for the roofing contractor, or general residential contractor? It means a larger revenue top line, of course. Back to the roofing contractor example, if a contractor has but 20 leads per month, that means six additional jobs. Those $12,000 jobs now add up to $168,000 instead of $96,000. And the contribution to gross margin: that jumps from $28,800 to $50,400 for a 75% increase. Over a year, using this modest example, that’s nearly $250,000 in added gross profit. Profit improvement can be a challenge. A method to make dramatic gains is by boosting the success rate of those sales leads that come into your company right now. These profit gains can be had with no additional advertising or marketing or adding people. Gains like these come with becoming better organized and energizing your team with CRM software that increased your probability of closing sales. You will reach prospects faster, eliminate confusion, and spend more time in the field selling rather than in endless sales meetings. MaxCon CRM Software provides the single or multiple office construction company a next generation system to move from paper based operations to a single centralized process to improve profits. MaxCon is tailored for large construction companies to the specialty contractor such as roofing, electrical, plumbing, etc..